Rare Daytime Fireball Lights Up Sky Over Eastern U.S.
A rare daytime fireball lit up the sky over much of the eastern United States yesterday (Feb. 14), causing necks to crane and jaws to drop from Maryland to Massachusetts. The fireball burned bright at around 12:35 p.m. EST (1735 GMT) or so, according to news reports. The wide region of visibility and its unmistakeable brightness make the fireball a unique event for lucky skywatchers, experts say. 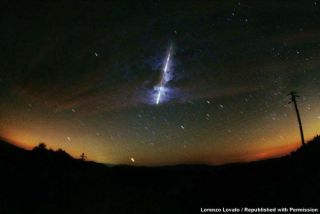 "Not very common," said Joe Rao, SPACE.com's skywatching columnist. "Indeed, this was a very rare event." Rao said he could only remember one other event like yesterday's, when a daytime meteor was widely seen across a broad swathe of land — and that happened in 1972, over the central U.S. and Canada. The cause of yesterday's fireball was most likely a meteor, rather than a satellite or falling piece of space debris, researchers said. "When you see something that bright streaking across the daytime sky, it's definitely a meteor," said Bill Cooke, head of NASA's Meteoroid Environment Office at Marshall Space Flight Center in Huntsville, Ala.
Other clues beside brightness implicate a space rock. "If it were a re-entering satellite, we certainly would have heard from NORAD [the North American Aerospace Defense Command] by now indicating that," Rao said. "Besides, all the observations we have received suggest that this object was visible for only a few seconds at most. A re-entering satellite would have traveled on a much longer and much slower trajectory across the sky." Cooke estimates that the meteor was probably about 5 feet (1.5 meters) across and weighed several tons, with a striking power equivalent to about 10 tons of TNT. "It was a fairly big hunk of rock hitting the atmosphere," Cooke told SPACE.com. Radar and other observations suggest that the space rock broke up over the Atlantic, Cooke said, probably off the coast of New York or New Jersey. While most pieces likely burned up in the atmosphere, some may have survived to splash down in the ocean — but we'll probably never know. Daytime fireballs like this one are relatively rare events, with about one reported per month all around the world, Cooke said. Cooke, for all his long experience observing and studying meteors and meteoroids, said he's still never seen a daytime fireball. Plenty of space rocks hit Earth during the day, but most don't create a fireball bright enough to be seen over the glare of the sun. And this one was bright. "To be so readily visible in the daytime, the meteor has to rival the full moon in brightness," Rao said. "In fact, not a few of the reports from yesterday indicated it had a magnitude of -26 — or as bright as the sun!" So yesterday's fireball was pretty special, and all those who got to see that streaking flash of light should count themselves lucky.